According to Wikipedia calendar is a system of organizing days for social, religious, commercial, or administrative purposes. This is done by giving names to periods of time, typically days, weeks, months, and years. A date is the designation of a single, specific day within such a system. Periods in a calendar (such as years and months) are usually, though not necessarily, synchronized with the cycle of the sun or the moon. Hello Cutness! internet based company offers 2013 printable monthly calendar for free to all. 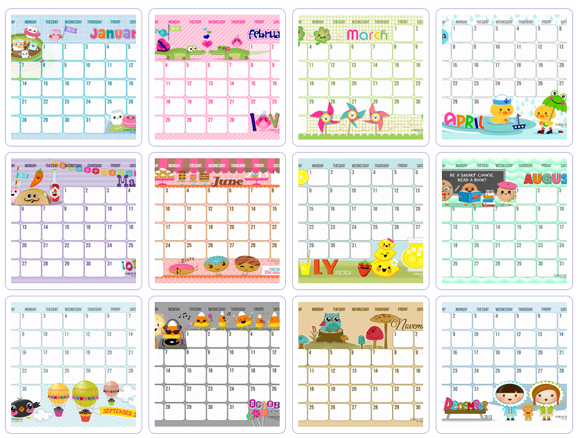 Hello Cutness calendar well designed mainly target children.